Do you find yourself making decisions out of fear? Are there things or people that you want to avoid at all costs? Or perhaps does your life revolve around pleasing others? Do you make decisions based on what you believe other people would want? Are you concerned about who likes you or dislikes you? Most people would agree that living in such a way is not ideal, and they offer many different solutions to the problem. 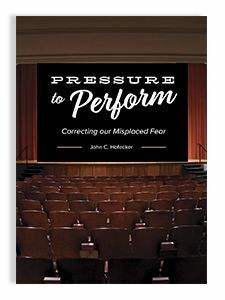 In this booklet, author John C. Hofecker explores what the Bible has to say on this subject, revealing that such concerns are rooted in a worship problem, with God-focused worship being the ultimate solution. John C. Hofecker is working toward a Ph.D. in Biblical Counseling with a minor in Systematic Theology at Southwestern Seminary. He previously earned both his Master of Divinity (with a concentration in pastoral counseling) and a Bachelor of Arts in Humanities from Southwestern. He also served for a short time overseas doing mission work in Central Asia. He and his wife, Stacey, have been married for three years.